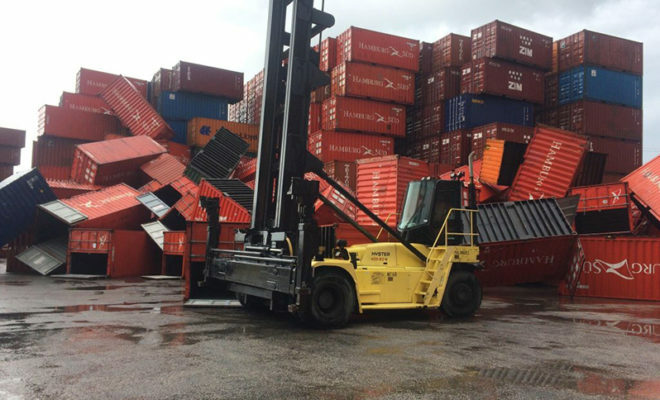 Those who live in the Houston area see their fair share of mighty storms tearing through the city, but it’s not often that it bring winds strong enough to knock over massive objects like shipping containers. In La Porte on Wednesday afternoon, ABC 13 reports that Cooper/Ports America general manager Alex Montoya confirmed that high winds and a possible tornado at the Barbours Cut Terminal in the Houston Ship Channel caused many containers to topple to the ground. Some of the units were empty, but others had materials inside of them. “It just got bad and dark really quick,” an employee told the news. “Containers were falling over, buildings were moving, trucks were being flipped upside down — it was just really scary,” another employee chimed in. KHOU writes that two employees working at the Barbours Cut Terminal were injured when the containers were blown over. There’s no update on their condition at this time. Other wind-related accidents took place in Pasadena where the Trimac trucking company sustained roof damage as well as flipped over vehicles on their lot. Though it’s not confirmed, it was most likely a tornado that caused the damage.